I'd seen reviews of Unearthly by Cynthia Hand around for awhile, mostly positive, but I'd never had that much interest in reading it. I figured angels are probably my least favourite paranormal creature to read about. It was only when a fellow blogger gave it a glowing recommendation before Christmas that I really began to consider it. 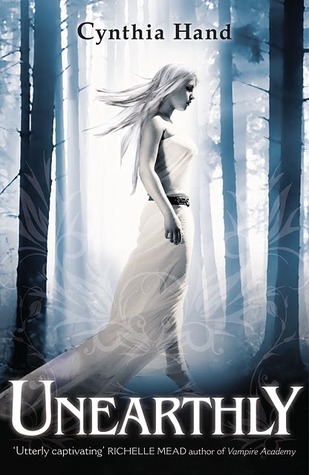 What helped it along is the gorgeous cover and the idea of the sequel, Hallowed, being released in January. I picked up a copy the following day. I'm so glad that I gave this book a chance! All those positive reviews I've seen? They're so true! To the book blogger who doesn't read paranormal but loves Unearthly and recommended it to me? Hurrah for you. Thank you for encouraging me to read this book. I was immediately swept away into Clara's head and finding out more about her part-angel abilities and especially about her purpose. Clara has recently learned that she is part-angel. Which means angel wings and the ability to fly, if she can ever master it. It means being better than most people at a lot of things, speed, strength, knowledge - especially of languages. And most importantly, being part angel means having a purpose. A reason for being, something important like saving somebody or giving a message. These purposes are only shown to Clara in flashes. She must piece together their meaning on her own and it means moving her family from California to Wyoming in order to fulfill Clara's destiny. Following the flashes leads Clara to a forest fire and to a boy, Christian. Clara is intent on doing everything possible to save this boy of her dreams. But when she starts having feelings for a different boy altogether, it really puts Clara in a difficult spot. Does she follow her purpose or does she follow her heart? I'll be the first person to admit to being sick of love triangles. They seem to be everywhere and I know a lot of people groan audibly at the thought of another one. But I'm so intrigued about the love triangle within Unearthly! I really cannot wait to find out where this is going. Initially, I thought Christian, the boy who is at the heart of Clara's purpose, was an all right guy, if a little dull. And as the book goes on, he became more and more surprising. But then there's Tucker! I can't help but feel warm and fuzzy about the wonderful, wonderful way in which Clara and Tucker's relationship progresses. There's actual friendship involved here and you can really feel how much their love is based on spending so much time together, getting to know each other. I love witnessing such relationship. I thought this book did an excellent job of creating a new world of part-angels with different abilities and choices and mythology. Despite not being so keen on angels before starting Unearthly, I was fascinated by the research Clara does to learn more about her kind. I also loved the themes of good and evil and also this terrible choice Clara has to make between following the destiny laid out before her and following how her heart feels. I'm SO glad you loved this book. Hallowed is equally as good too. And I totally agree about the love triangle..it's done well here. This one's passed me by, sounds like a good read though. The first few Angel books I read I wasn't a big fan but since Angel I've done a big U-turn on them and this one sounds fab too! Oh I did adore Angel as well! Though I haven't read the sequel. I guess like any books about a particular paranormal creature, the stories can be done well or not so well. And this is definitely one of the books done well! i seriously loved this book! unearthly had me up staying late at night wondering what will happen next. my mom even told me to stop reading it and get some sleep, 'cause it's about 2:00 am. suprisingly, i just read the book in 2 days!